A 3-step, 3-minute cleaning fix. First, I start by using my Nutri-Pure cleanser, which I use morning and evening. Then I apply the Liftessence Oil Elixir, followed by the Hydra-Eclat toner to emulsify all textures for a deep and gentle cleansing. Then I start layering my skincare. A 3-step, 3-minute serum, a drop of oil, finished with the Liftessence moisturizing cream to seal in all the ingredients benefits. I like to keep my makeup quite minimal during the day—my Densiliss primer and foundation give my complexion an impeccable, flawless finish. I'm obsessed with our new mascara right now, the Lash-Expert Twist Brush. I like to use the elongated brush during the day for a more natural result. Then I finish with my signature red lip—the Rouge-Expert, No.17, My Red. Having an amazing family who loves and supports me. 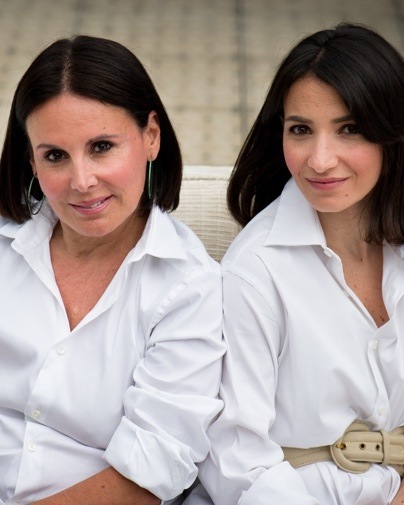 (She is shown above with her daughter and the company's CEO, Marion Assuied). I know that my family and friends are always there for me. Having such a busy working life means you can often forget how important it is to spend time with your loved ones and cherish all the moments you have with them. It has therefore always been mine and my husband’s mantra to work hard most of the time, but then to allow ourselves to switch off and reunite with the family. Fulfilled. One of the main reasons I created my beauty brand was to instill in women a feeling of self-confidence. It is only by being truly content with yourself that you can achieve happiness. Helping women. My husband and I are heavily involved in campaigning for Breast Cancer Awareness, as well as other charities. I truly believe that it is a duty for someone in my position to participate in raising social awareness and to support charitable foundations. Coco Chanel. She was not only a style icon, but a pioneer in changing society’s perception of women. She taught women not to be afraid to express themselves. Through her brand, she created her own true signature and identity, and that is why it is so timeless. Ingu. This is what my husband calls me, and translated it means, ‘I never give up’. I call all my closest friends and loved ones ingu. That it’s superficial. The world of beauty, like fashion, is about empowering women and teaching them to express themselves and their individuality. At By Terry, our philosophy is that there is no one type of beauty: all women are beautiful because every woman is unique, and we are all experts of our own beauty! Always staying true to myself. We all have many facets, but that is what makes us unique. It’s important to embrace all sides of ourselves, including our flaws. Gardening and table arrangement. Last month, I opened a mini boutique in our Paris flagship store in Galerie Véro-Dodat dedicated to table arranging. On display are some of the many vintage ornaments and antique pieces I have collected over the years, which people can now buy.